2015 has started and I realized that in between the New Year and last week’s tragedy, I hadn’t had the time to discuss what’s on the table for the Document Foundation in 2015. This is purely a personal opinion and does not represent any sort of official statement by the Foundation. Let’s try to keep this somewhat synthetic. 2015 will be the year of mobility for LibreOffice. The end of 2014 had seen the announcement of CloudOn’s new office suite for iPad, and this office suite is basically powered by LibreOffice. 2015 will see the first results of the development of our Android version. Don’t look for a scoop here: it will be gradual so you will have to take every announcement from the Document Foundation on Android as a chapter in a story. Cloud-wise, the work is still ongoing. You may think we’re taking a long time doing this – and there’s some truth in that. It is important however to consider the following: a cloud version of LibreOffice is not about starting from scratch and releasing something like etherpad. Quite the contrary: it is about “porting” (for lack of a better term) LibreOffice in the cloud, with most of its feature. And that takes a lot of effort, which means constant work by developers who would be glad to have their work subsidized in some way, but who also work on several existing projects, including LibreOffice itself. 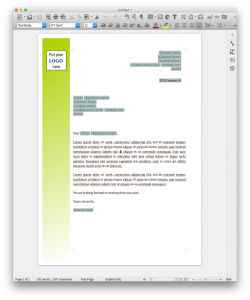 It is hard to predict how LibreOffice will evolve in 2015 as we do not work with roadmaps. But from what I can see, I see three trends. The first one is a better, more beautiful interface for the OS X version. This was started sometime in 2013, but it will be a reality starting soon, with the upcoming release of the 4.4. The second trend did start with the 4.0 release: more powerful spreadsheets with more features. The third one stems from the benefit of having a more active UX / Design team: improvements in the user interface are being released more frequently and are thus more visible now. Even more document filters: better compatibility with OOXML, Abiword, Clarisworks, Corel… and even better: filters that can be reused by every other FOSS document editors, thanks to the active Document Liberation Project. I guess it’s difficult to know these things before you have experienced them first, but managing and growing a foundation like the Stiftung or any other similar entity such as its counterpart in France, Switzerland or Italy is a full time job. It requires detail and accuracy in execution and the the management of the structure, but since the foundation relies on the community for its actual activities, it requires the involvement of all kinds of people, which in turns implies that a complex human ensemble has to work with a complex yet robust legal machinery. The situation is gradually improving. The employees and contractors of the foundation have the rare quality of being great community members and fit well within the operations of the foundation. I expect these operations to improve and accelerate in 2015 because of all these factors. Which also means you should expect more announcements from the foundation this year. Our community is growing and more interestingly, the way it is growing is not only by the arrival of new contributors to the code, but also by new, non technical contributors who may be more familiar with social networks than with mailing list. Even more importantly, we seem to gather traction everywhere with the arrival of contributors whose native language is not English and whose mastering of that language is all but certain. This means that now we have very active community members who are outside mailing lists but on social networks: Google +, Twitter, LibreOffice, and on websites that are in languages completely different than English, while contributing locally without necessarily liaising with the more “central” project. We need to take this into account – and being part of the Membership Committee I can say this is an important discussion we are having and will continue to have this year. This also calls for more awareness in how we work with each other, acknowledgement of contributions; on the other hand, it suggests that we finally get to tackle the need for a more formal management of our relationship with local entities. But above everything else: let’s continue to have fun! Thank you everyone for your time and efforts you dedicate to this project. I’m looking forward to a great year 2015. 4 Responses to "The Document Foundation: a personal outlook for 2015"
It is quite ironic to see someone writing about ‘more diverse community’ while having only one particular type of diversity in mind and totally disregarding e.g. the fact that there is almost zero gender diversity in LibO community. … are women and well known inside our community. I was referring to the diverse community in terms of origin and age. But again, there is progress to be made in the gender area. Thanks for the blog entry on LO in 2015. I highly appreciate the dynamics behind TDF and LibreOffice. What I found interesting is that “Cloud-wise, the work is still ongoing”, because it has been very silent on this. It would be perfect if the LO team published an update on this development in a blog entry. Thanks for your wisdom and big ideas. Libre Office is a good way to humankind for to get unity without big firmas as godfathers.